Merge bill is simply transferring a bill item to another bill. All item in bill 1 will be transferred to bill 2 and bill 1 will be deleted. Works only for takeaway bill. 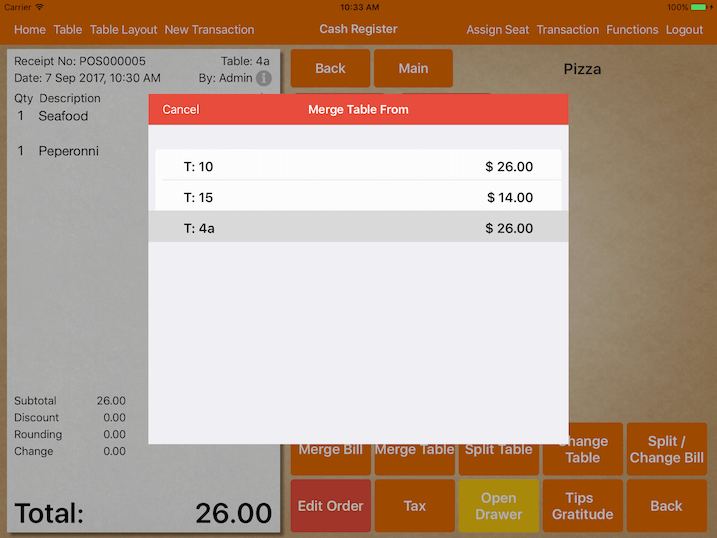 Merge table works the same as merge bill, however it works for dine in bill only. Split some of the item into a new bill with same table number. Before splitting, you could choose Split or Split & Pay. Choosing Split, a new bill will be created and you could proceed to split again with the leftover items. Selecting Split & Pay, it brings you to the new bill so you could proceed for payment. If you proceed payment immediately, system will prompt you if you would like to split the original bill again. This would speed up the process where a group of customers want to pay their own bill sitting in the same table. Change table simply transfer all item from Table A to Table B by leaving Table A unoccupied and Table B occupied. It has the option to notify the kitchen about the table change. Works the same as split table, except it works for takeaway bill as well. Choose which order to be split. By choosing the number of pax to split, MobiPOS automatically calculate the split amount for each pax. By splitting to 2 pax, transaction #000001 will split to #000001-1 and #000001-2. Once a bill is split, no additional orders can be taken. Split by percentage works the same as even split by pax, the only difference is that you could specify the percentage for each pax. You could also specify by bill amount instead of the percentage. System will reverse the calculation to the nearest percentage split. Transfer item to a new table or new bill. If you have entered the wrong amount to split, you could undo it. Just retrieve one of the split transaction and click on Void. Click Yes to revert splitting the bill. If a bill has been hold without assigning a table, you could transfer the takeaway bill to dine in table. If orders in the bill has price difference between dine in and takeaway, order's pricing will be updated accordingly. Transfer a dine in bill to takeaway bill.